Jim Paine’s commitment to our community is demonstrated by his calling Fulton County home for more than 60 years. Jim is an active leader who seeks new ways to improve the place where he lives, works and has raised his three children. 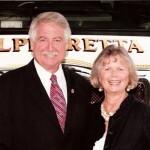 He has provided solid conservative direction as an Alpharetta City Member, including nine years as the Mayor Pro Tem and a short stint as the acting Mayor. His skills as an entrepreneur have helped him maintain our area’s pro-business environment. He majored in Marketing at Georgia State University and had a 19-year career as a self-employed manufacturer’s representative in the radio communications industry. Jim also served as the City of Alpharetta’s Recreation and Parks Liaison, and he earned the Georgia Recreation and Parks Association’s “Volunteer of the Year” award. Additionally, he is an active member of the Rotary Club of Alpharetta. Senior Services North Fulton is a Community based nonprofit organization which provides meals-on-wheels, congregate meals, home maker services and activities to senior citizens in North Fulton County. SSNF presently has a staff of twenty (20) and over eight hundred (800) volunteers. PAL is a non profit, recreation based, youth crime prevention program for at-risk youngsters in our community. PAL is operated by police professionals and volunteers. PAL offers many programs, including after school tutoring, summer camp, boxing, to mention a few. Present Chairman Board of Directors Vice-chairman 1996 – 2006. NMML is a non profit adapted sports league with emphasis on interaction between persons with and without disabilities. Based at Alpharetta’s North Park, over 1500 volunteers serve more than 300 families with one or more member with disabilities. A new facility was just completed and paid for by corporate sponsors, individuals, and in kind donations exceeding one million dollars. Board of Directors 2003 to 2006.